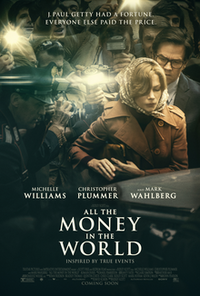 All the Money in the World is a 2017 crime thriller film directed by Ridley Scott and written by David Scarpa, based on John Pearson's 1995 book Painfully Rich: The Outrageous Fortunes and Misfortunes of the Heirs of J. Paul Getty. It stars Michelle Williams, Christopher Plummer, Mark Wahlberg, Romain Duris, Charlie Plummer, Andrew Buchan, and Timothy Hutton. The film depicts J. Paul Getty's refusal to cooperate with the extortion demands of a group of kidnappers from the organized crime Mafia group 'Ndrangheta, who abducted his grandson John Paul Getty III in 1973. Kevin Spacey originally portrayed J. Paul Getty, appearing in the film's initial marketing campaign. However, after multiple sexual assault allegations were leveled against Spacey, the role was recast with Christopher Plummer, who was Scott's original choice for the role. Scenes were reshot just a month prior to the film's release. This webpage uses material from the Wikipedia article "All_the_Money_in_the_World" and is licensed under the GNU Free Documentation License. Reality TV World is not responsible for any errors or omissions the Wikipedia article may contain.